March 26, 1987 to January 8, 2018 Passed away suddenly and peacefully with his family by his side after a brief illness. 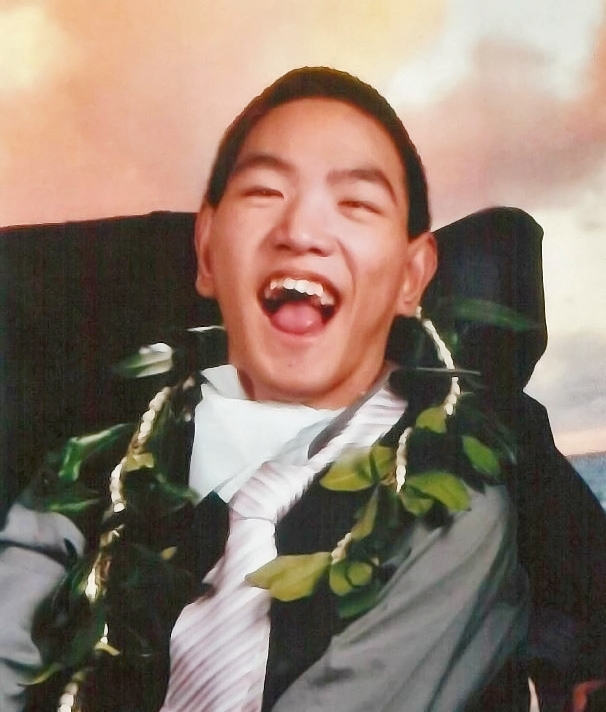 He was born four and half months premature and weighed one pound at birth in Honolulu. Despite all the challenges he faced, Andrew lived to be almost 31 years old. His strength, perseverance and character were reflected in his sparkling brown eyes and a smile that made one forget their troubles and gave one hope. He attended Manana Elementary, Waipahu Intermediate, Waipahu High School and Family Services of Oahu. He is survived by his loving parents Stanford and Roberta Afong. His adoring sister Carolyn (Michael-Dean) Maielua and devoted brother Jason (Chontille) Afong. His nieces and nephews, Tehani, Mika, and Kanilea Maielua, and Jycobi and Jediyan Afong; grandmothers Margaret Abellanida and Kay Phillips as well as numerous Uncles, Aunties, and cousins. Visitation at 8:30 am; Service at 10:30 am; Burial at 12:30 pm at the Mauka Chapel at Mililani Memorial Park on Friday, March 2, 2018.